These are some of the everyday thoughts people have about weather and climate. Though climate and weather are closely related, they aren't the same thing. 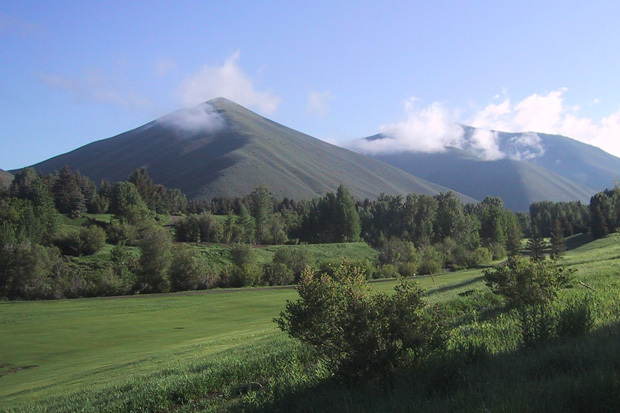 Whether there is mist on the mountains on a given morning is a weather question. Whether such misty mornings are common or unusual is a climate question. Photo by Betsy Youngman. The short-term state of the atmosphere—in the past, present, or future—is weather. People describe weather in terms of temperature, precipitation, humidity, cloudiness, wind, and other variables. Weather can vary from minute to minute and location to location. For instance, it's not unusual for a place to have a cloudy, wet morning that gives way to a sunny afternoon, or for rain to fall on one side of a town, but not the other. In order to make sense, descriptions of weather always include both time and location. An example of weather: Daytime high temperatures on June 20, 2016, during a scorching heatwave in the U.S. Southwest. Map by Dan Pisut, NOAA Environmental Visualization Lab, based on NOAA RTMA data. Climate is a description of the long-term pattern of weather conditions at a location. The expression “long-term” usually means 30 years or more: climate scientists have agreed that 30 years is a good length of time to establish the usual range of conditions at a given location throughout the year. 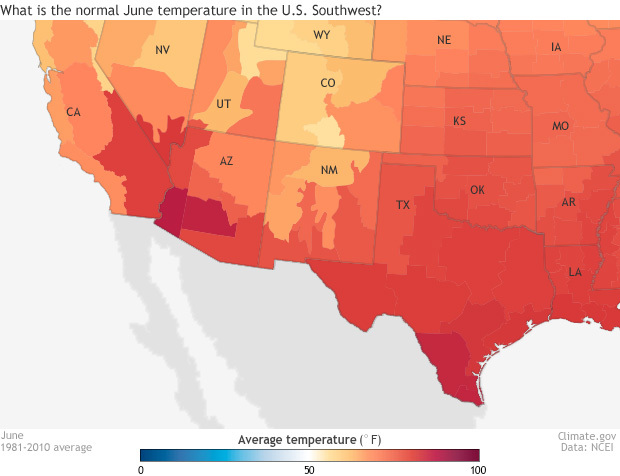 An example of climate: Map of average June temperature in the United States (1981-2010), based on the U.S. Climate Normals data. Looking at three decades of weather records for a place, you might summarize them by saying the summers are hot and humid and the winters as cold and snowy. While these descriptions of climate provide a sense of what to expect in each season, they don't provide any details about what the weather will be on any given day. Climate is what you expect; weather is what you get. Weather tells you what to wear each day; climate tells you what to have in your closet. Weather is the chocolate caramel truffle, climate is the whole box of chocolates. Worldwide, scientists observe weather conditions at thousands of stations every day of the year. Some observations are made hourly, others just once a day. Over time, these observations allow us to define what’s normal at each location. Mathematical averages of daily weather conditions (average temperature, average precipitation, and average humidity, for instance) are used to describe a region’s climate. Animation showing maximum daily temperature ("daytime high") at Washington National Airport for 1 year, 3 years, and 30 years. By the time 30 years of observations have been collected, the scattering of individual dots (weather) becomes a broad swath that marks our the range of normal daytime high temperatures (climate). Animation by NOAA Climate.gov. Download individual graphs (zip folder). What is the Value of Long-term Record Keeping? In many locations around the United States, systematic weather records have been kept for over 140 years. These long-term records enable users to detect patterns and trends. (1 min, 4 sec) The difference between weather variability and long-term climate trends is like the difference between the path of a dog and the path of the person walking the dog. Credit: Siffer, produced by TeddyTV for NRK (Norwegian public TV). Animation by Ole Christoffer Haga. The long-term effort to collect, quality control, and organize data to make it available online serves scientists, natural resource managers and other decision makers, and citizens. One place to find climate data is the Climate.gov Dataset Gallery. The full national climate archive is maintained by NOAA's National Center for Environmental Information.